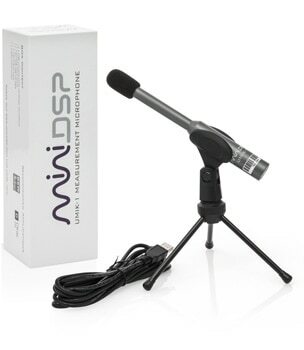 The miniDSP PMIK-1 is the perfect pocketable companion to audio analysis programs running on your tablet or even your smartphone. In this application note we will show you how to set up the PMIK-1 for use with the AudioTool app for Android. Please note: miniDSP cannot provide support for third-party applications or hardware. This app note shows you how to set up the miniDSP PMIK-1 to use with AudioTool but other functions of the Android device or the AudioTool app are beyond the scope of miniDSP support. To generate audio output from the Android device for the purpose of measuring system response, connect a cable from the rear of the PMIK-1 to the system being tested. At the PMIK-1 end, the cable will have a 3.5mm stereo jack. A 3.5mm to RCA socket adapter is included with the PMIK-1 to make it easy to use regular RCA cables to connect to the system. If you haven't already, install the AudioTool app on your Android device from the Google Play Store. Connect the Android device to your PC or Mac with a USB cable. On Windows, you should be able to access the Android file system directly. On the Mac, you will need to use the Android File Transfer program. Install the OI File manager app on the Android device and move the calibration file from the Download folder into the AudioTool folder. In the app, click on the options icon (three vertical dots) and select Load Cal. Click on the name of the calibration file. This will load the frequency correction data into AudioTool. Because different devices will have different sensitivity on the microphone input, it is impossible to provide a standard adjustment to get correct SPL readings. You will need to use an external sound source with a known SPL and adjust the Global Offset parameter, as described in the AudioTool documentation. Now we will generate a test signal to feed into the system. Tap on Gener in the bottom right corner. On the signal generator screen, select Pink (pink noise) and then tap on the Off button (which turns the signal generator on). Note: be careful with the volume! You can now explore the different types of measurement and analysis tools available in AudioTool. Please refer to the AudioTool documentation, and have fun with your PMIK-1!